This enclosed porch on a Victorian house was constructed in the 1970's with a number of construction flaws that led to extensive rot and deterioration. Here, all the single pane glass has been removed, areas have been opened for inspection and repair, and temporary protection has been erected to protect the carpeted floor. 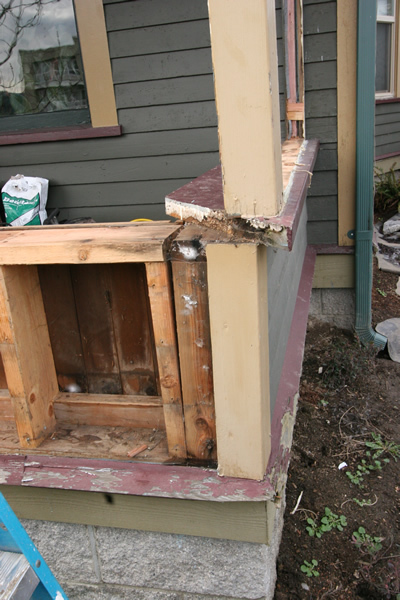 The 1970's foundation for the porch had been built 2" out of line with the existing porch roof. In addition, the posts did not extend all the way to the foundation but instead landed on the windowsills. The resulting out-of-line forces were tearing the two walls apart from each other and dislodging the glass above. 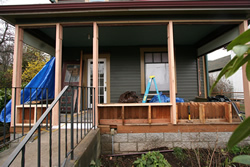 All the windowsills and most of the posts had extensive rot from inferior materials and construction details. 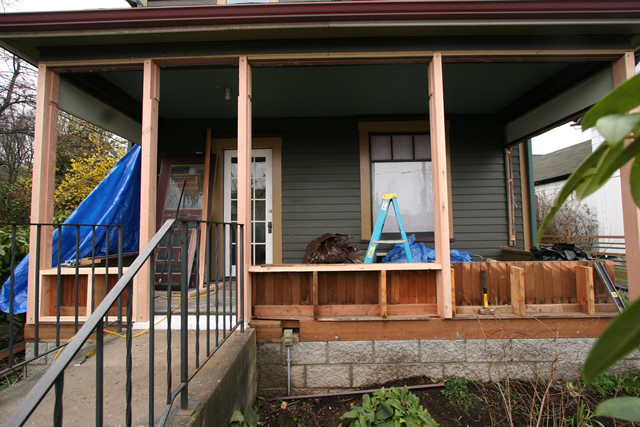 Here all the posts have been replaced with full-length material, all the rot has been removed, and new sills are being installed. 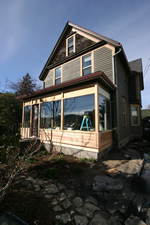 To avoid excessive environmental and monetary cost all the clear fir was carefully selected by looking through large quantities of stock framing lumber for the few available straight, clear sticks. 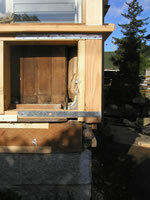 This shows the out-of-line post from before replaced with a full-length piece. 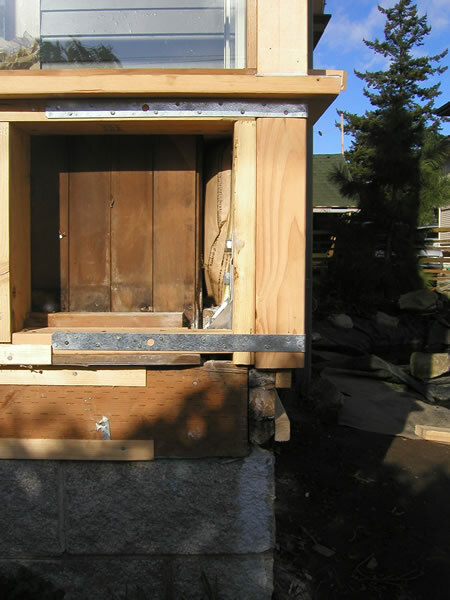 The post and framing have been securely strapped together and the post has been bolted down to the concrete foundation with a large hold-down bracket. The rim joists have been replaced with pressure treated material and are "furred out" so that the finished trim will appear somewhat more in-line despite the foundation being 2" to the left of where it should be. 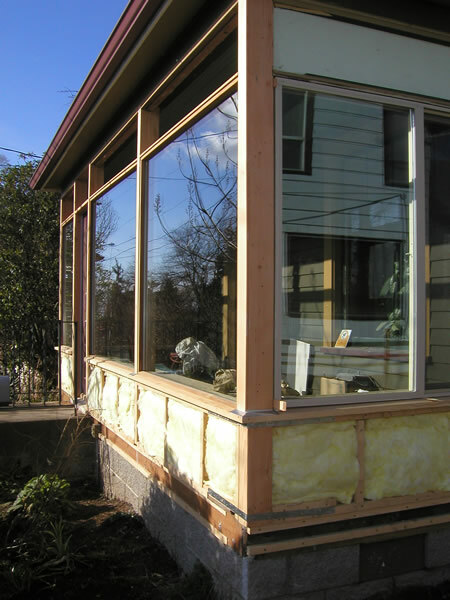 New insulated glass and insulation help to turn this once cold and underutilized area into usable living space. The open areas above are ready to accept new solid panels of Medium Density Overlay plywood - a smooth, paintable material that will last much better than the rough-cut plywood originally used. These spaces will also be insulated will 1-1/2 inches of solid foam board. 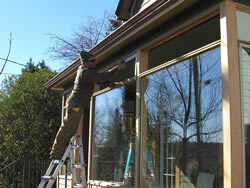 All the post/windowsill penetrations have been carefully flashed with metal. 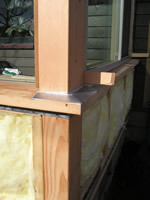 The metal has been "let in" to a small horizontal saw kerf in the posts and are bedded in a high quality exterior caulk. 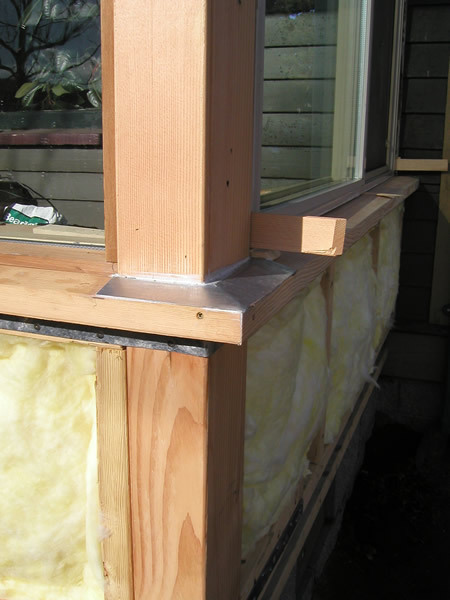 This important detail prevents water from traveling down the full-length posts, behind the windowsills, and into the framing. A sunny day in January! Dry cold air and bright sun was often blinding against the east face of the house. Just as often the rain and wind stopped work all together. One high windstorm necessitated an emergency evening trip to secure tarps blowing in the gale. 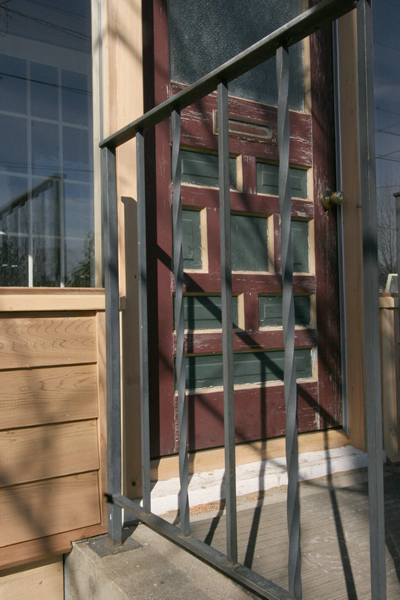 The original door has been reinstalled between new posts. 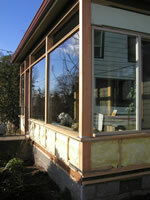 A new sill of solid oak has been pre-primed on all sides. 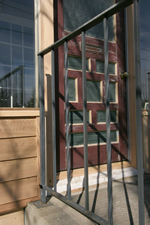 This installation required the posts to be carefully positioned at the rough framing stage so that the door would fit precisely. 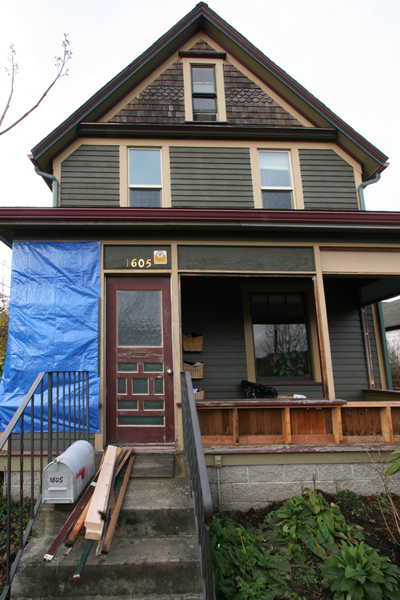 The finished porch is ready for paint. This remodel has transformed the front of the house and improved the view from the street. Valuable living space has been added to the house. With regular care and painting this work should last the life of the house and not be subject to the premature deterioration common to so many porches.